An elongated rectangle pattern with an upward or downward slope is referred to as a price channel. Being a continuation pattern, the price break out usually happens in the direction of the prior trend. However, trend reversal scenarios can happen occasionally. Thus, a trader should equip himself with adequate knowledge to identify a price channel (bullish/bearish) and choose a suitable binary options contract to trade with. In a rectangle pattern, the price moves horizontally between upper and lower price limit. If the price moves with in a tilted upper and lower boundary then it leads to the formation of a price channel. When the slope of the channel is positive (tilted upwards) it is called as the bullish price channel. On the other hand, a bearish channel consists of a negative (tilted downwards) slope. 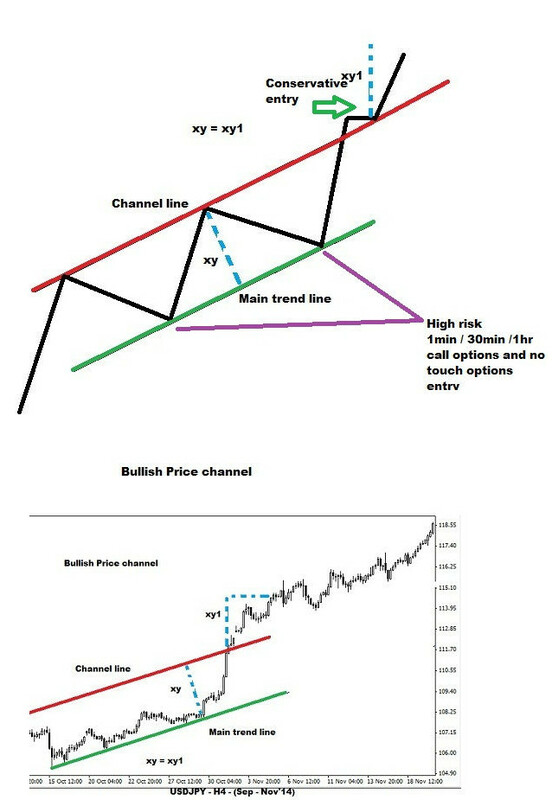 In the case of a bullish price channel, at least two reaction lows are connected to form the main (upward slope) trend line. A channel line is drawn parallel to the main trend line by connecting two reaction highs. Occasionally, only a single reaction high is used to draw a channel line. The channel line acts as a resistance in the case of a bullish price channel. As long as the price rises and trades within the channel the trend is considered to be bullish. If the price breaks above the channel line with a rise in volume then it is considered to be an acceleration of a price uptrend. Rarely, the price may break below the main trend line. The price will retrace just short of touching the channel line before such an event happens. At least two reaction highs are connected to form the main downward sloping trend line in a bearish price channel. A channel line is drawn parallel to the main trend line by connecting two reaction lows. Rarely, only one reaction low will be used to draw the channel line. The channel line acts as a support in the case of a bearish price channel. Once in a while, the price may break above the main trend line. Before such an event happens, the price will bounce before touching the channel line. As long as the price declines and trades within the channel the trend is considered to be bearish. If the price breaks below the channel line with a considerable increase in volume then it is considered to be an acceleration of a price decline. The target price is calculated by adding (bullish) or subtracting (bearish) the width of the Price channel to the point of price breakout. A binary options trader can purchase a 1min / 30min /1hr call options when the price breaks above the channel line acting as a resistance in a bullish price channel. Being a continuation pattern, the price will break in the direction of the prior trend. Since the precise time frame for breakout cannot be estimated, it is better for a binary options trader to wait for the break out to happen. As long as the volume rises during the breakout the trade will result in a profit. Furthermore, the momentum should aid the price movement in the direction of breakout. Only sudden news resulting in a trend reversal will make the contract expire out of money. Alternatively, a high risk trader can purchase a 1min/30min/1hr call options when the price touches the main trend line acting as support. As long as the main trend line is not violated by the price movement, the trade will end in profit. Unexpected news can create price spikes which would make the contract expire out of money. The reliability of a price channel increases with the time taken for its formation. Thus, a trader can purchase a one touch call options contract only if the price channel takes at least 3 months to develop. The entry into a trade can be done as soon as the channel line acting as a resistance is broken with a rise in volume. The breakout should be supported by a strong momentum. Additionally, in order to enter a trade, the probable target price should be above the one touch call option target stipulated by the broker. Lack of volume and loss of momentum would result in a reversal or range bound trading thereby leading to an out of money expiry. There are situations where the one touch call options target set by the broker would be far away from the probable price target calculated from the width of a bullish price channel. In such circumstances, if the price breaks above the channel line with considerable volume then a no touch options contract can be bought by a trader. As long as the volume and momentum scenario aids the price uptrend, a trader will have no difficulty in reaping handsome gains. Only unexpected news favoring a trend reversal would result in a loss of trade. Since there is no target price to be hit, as long as the trade is taken after the breakout, a trader can feel quite comfortable with this type of binary options contract. A high risk trader can also purchase a no touch options contract when the price bounces off the main trend line. As long as the price does not violate the channel as a whole, the contract will expire in the money. Only spikes arising out of unexpected news will make the contract expire out of money. 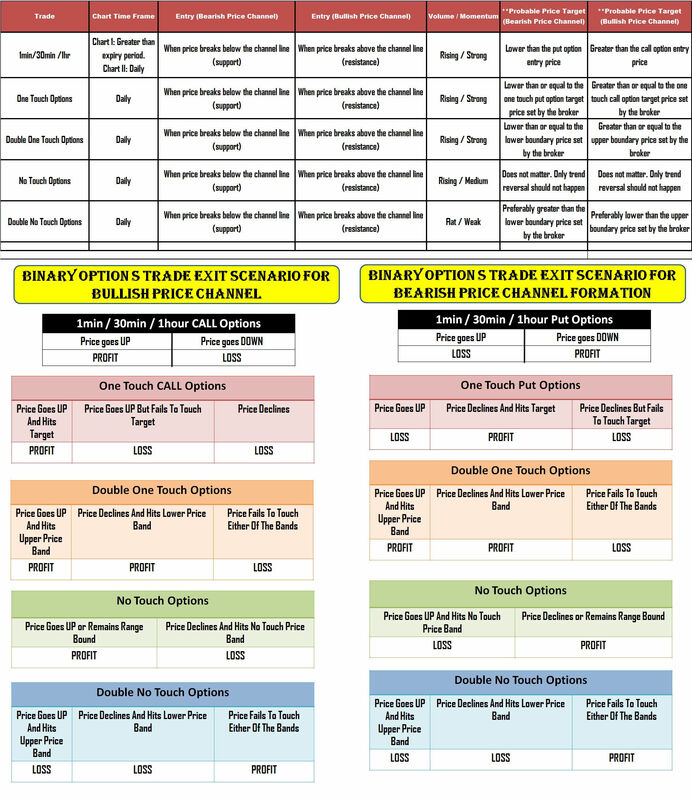 A trader can consider purchasing a double one touch options only if there is a scheduled high impact news announcement before the expiry period of the contract. Positive news would trigger further uptrend, which would result in hitting the upper boundary target price set by the broker. On the other hand, negative news would initiate a sharp price reversal and violation of the lower boundary price target set by the broker. If the news halts price volatility then the contract would expire out of money. The volume should rise when the price breaks above the channel line. The momentum should remain stronger. Only then a trader should consider buying a double one touch options contract after considering the news scenario. A double no touch options contract should be purchased when the price breaks above the channel line without any significant rise in volume. The momentum should also remain weak. Such a scenario will keep both the price boundaries (set by the broker) intact and ultimately the contract will end in the money. Any unexpected news would increase volatility (through rise in volume and momentum) thereby resulting in a loss (contract will expire out of money). A bearish price channel shares all the traits of a bullish price channel except for the fact that the price will break below the channel line acting as the support. 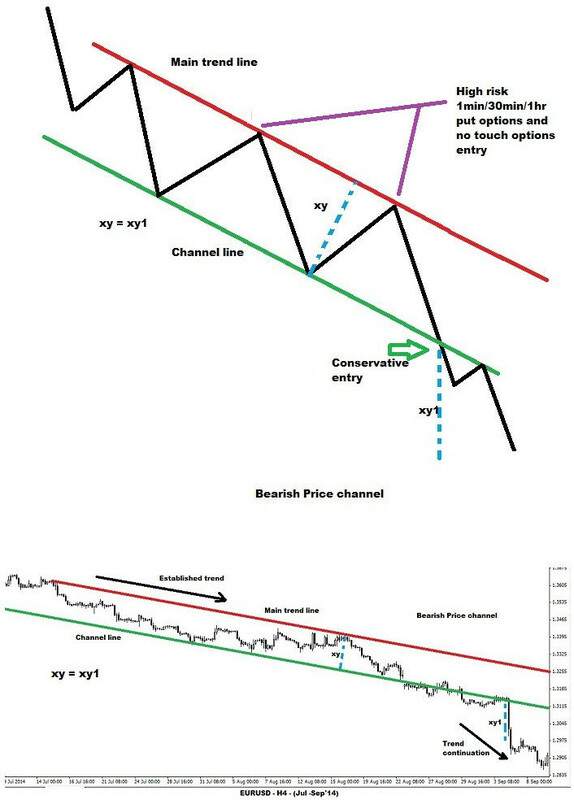 Thus, a bearish price channel is traded (entry rules) in the same way as a bullish price channel. However, instead of call options, a binary options trader should purchase a 1min/30min/1hr put option and one touch put option contract after the price breaks below the channel line of a bearish price channel. A high risk trader can also purchase a 1min/30min/1hr put options and no touch options contract when the price starts retracing after touching the main trend line. Only a spike arising out of unexpected news would result in a loss. As long as the price channel is not violated, the contract will expire in the money. A no touch option, double one touch option or double no touch option can be purchased after monitoring the volume and momentum scenario. The trade execution is carried out using the same methodology adopted for a bullish price channel. It should be remembered that a trader should have a close watch on the scheduled news announcements before deciding on the nature of binary contract to be traded after the price breaks below the channel line. A trader should regularly practice drawing price channels using the facility provided in the trading software. Once enough experience is gained, capitalizing on a price channel will not be a complex process.